The EQuIS Professional Installer can be used to repair a corrupted installation of EQuIS or to change installation options after the product has been installed. The Installer requires administrative permissions on the computer in use. 2.Select Programs and Features (or Add or Remove Programs). 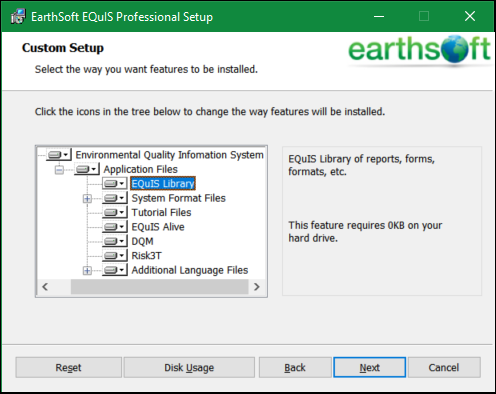 3.Locate the entry for EarthSoft EQuIS Professional and select it. Files can become corrupted. 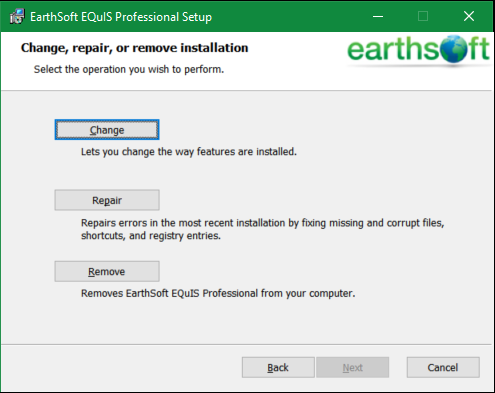 In many instances, the EQuIS Installer's repair function can solve the issue by replacing the corrupted files with fresh copies. 1.Select Repair from the screen pictured above. The Repair window opens, indicating that it is ready to repair the EQuIS installation. There are times when it is necessary to change the EQuIS Professional installation. Often, this is to include features or formats which were not selected when EQuIS Professional was originally installed. 1.Select Change from the screen pictured above. 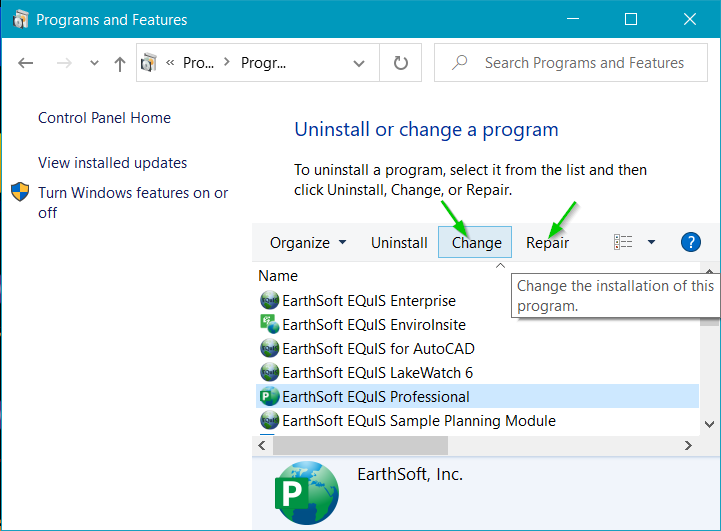 2.The EQuIS Installer brings up the same options as when first installing EQuIS, showing what features had previously been selected for the installation. Select the features or formats to include as explained in the Setup Customization section of the help article Installation Wizard. 3.Complete the installation as explained in the "Begin Installation" section of the help article Installation Wizard.